Finally, ultra-portable digital recording is catching on. Edirol got the party started with the R-1, a CompactFlash-based USB device packed with a decent built-in stereo mic, effects, a metronome, and tuner. The extras on the R-1 are nice, but the unit was big and boxy, so when M-Audio introduced their cuter, iPod like MicroTrack, also a CF recorder, much of the attention turned to them. Now it’s Edirol’s turn again with the R-09. It’s got a small, curvy form factor like the MicroTrack, costs $450 list, and includes an excellent built-in mic. How do these units compare (on paper, anyway)? File format: Like a numebr of new recorders, the R-09 lets you choose between uncompressed linear WAV and MP3, with MP3 bitrates up to 320 kbps. For the record, the R-09, R-1 and MicroTrack support up to 24-bit, though only the MicroTrack can record up to 96 kHz. I seriously doubt anyone would want a sampling rate that high on this recorder, though, so that’s unlikely to be a deal-breaker. Form factor: I believe the R-09 is actually slightly smaller than the MicroTrack. It’s certainly much prettier, and the silver case is a delight to hold. I also like the extremely friendly controls on the R-09; one button gives you recording on both, but the Edirol more nearly apes the controls on an MP3 player. Display: Here’s the best thing about the R-09: the reverse-colored LCD screen is simply gorgeous. It’s easier to read, and it’s easier on battery life (you’re only backlighting characters, not the whole screen). Mic: Both units come with a stereo electret mic. On the MicroTrack, it’s an add-on you plug into the top. 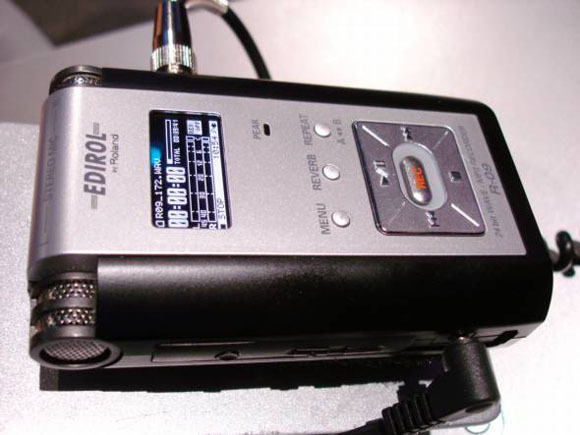 On the R-09, the mic is integrated with the device. The latter is slightly more convenient, and because this is a solid-state device, noise from the device isn’t much of an issue. Roland reps I talked to at the show said they thought this might actually be a slightly better mic than what was on the R-01, which already had impressive recording fidelity. (Stereo electret mics, while very cheap, are often underrated — while they’re not going to give you a flat recording, they can do a decent job.) The R-09 also has some nice recording options: dedicated input control, mono/stereo selector, low-cut filter, and gain boost. 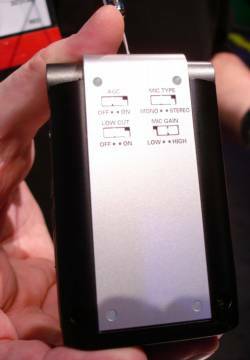 Phantom power: A controversial element of the MicroTrack was its inability to put out a full 48V phantom power for mics. Not a huge issue given the target market, but Edirol said they have true 48V phantom power on the R-09. That spec isn’t on the Roland website, though, so the jury’s still out. I/O: M-Audio retains the slight edge here, because it has balanced TRS inputs and optical inputs. The R-09 has mic and line ins (minijack), and USB. The headphone jack doubles as optical out. That’s too bad: I think there’s more of a market for optical in recording than optical out, because most of us are going to use the USB to off-load audio. Then again, if you’re not planning to do digital-in recording, the R-09 is fine. Battery: The MicroTrack uses a rechargable Lithium-Ion battery. The R-1 and R-09 both use AA batteries (rechargeable AA’s work, too). I much prefer the latter setup, and battery life should be roughly comparable — a few hours of record time mean you’ll probably run out of storage space before you run out of juice. Effects and Extra Features: Here’s the one remaining reason to get an R-1 over the R-09 or MicroTrack: the R-1 has 13 built-in effects (microphone simulator, noise suppressor, hum-cut, EQ, reverb, center canceller), a metronome, and a tuner. The R-09 has a reverb only. The MicroTrack has none of the above. Conclusions: So there you have it. What we really need now is a recording run-off between the R-09 and MicroTrack, because their features and form factor are otherwise nearly identical. The MicroTrack is your choice if you want optical in, and the R-09 if you prefer a truly integrated mic and real phantom power, but the other features are so close I’d want to see extended hands-on reports with each before buying. I expect we’ll see some reviews of each soon — CDM will have to battle with every other reviewer on the planet, but if I don’t get one, I’ll point you to someone reputable who has. What about the R-1? Edirol says they’re continuing to sell the R-1, and with good reason: the effects, metronome, and tuner remain unique. I have to admit, I like the idea of having a do-all musician’s tool, even if the R-1 is chunkier looking. I do have one of these on test, and will offer my review soon, complete with sound samples.